TDN Content Team: This has been written by a Neopets player who isn't a part of the TDN team. We cannot answer for, verify, or accept emails on this subject. The original auther is luna_sunshine on Neopets. 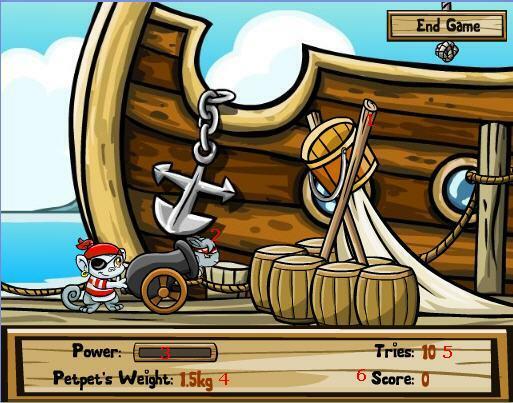 After the pirates of Krawk Island had discovered that their cannonballs were stolen, they decided to improve their cannon skills with petpets instead. Your task is to angle the cannon, to load and to fire. Your target is a bucket where you are supposed to shoot the petpets in, in order to score points. You only need three keys: the up and down arrow keys and the spacebar. Let's have a closer look at the screen. The bucket. This is your goal. The petpet is supposed to go through it. The cannon, including petpet as cannonball. The first thing you have to do is angling the cannon, using the up and down arrow keys. Generally one could say that angling it high gives a better chance of scoring. The power bar. After putting the cannon in the right position, loading and firing is the next thing to do. This is where the spacebar is for. The longer you press it, the more power you give the cannonball petpet and the farther it will go. The moment you release the spacebar, the petpet will be launched. The weight of the petpet. This is a factor in the game which shouldn't be overlooked. A heavy petpet needs more power to reach the bucket, so you have to press the spacebar longer. Also, the more weight the petpet has, the more points it will give you when you score. 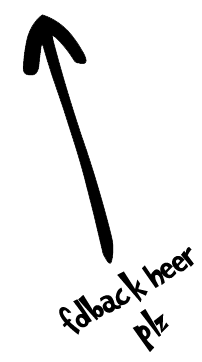 The weight can vary from 0.8 to 1.5 kg. The number of tries you have left. Every time you miss and the petpet falls to the floor or flies away, you lose a try. But (hopefully) not forever, since every time you do manage to score, one try will be added. Your score at the moment. 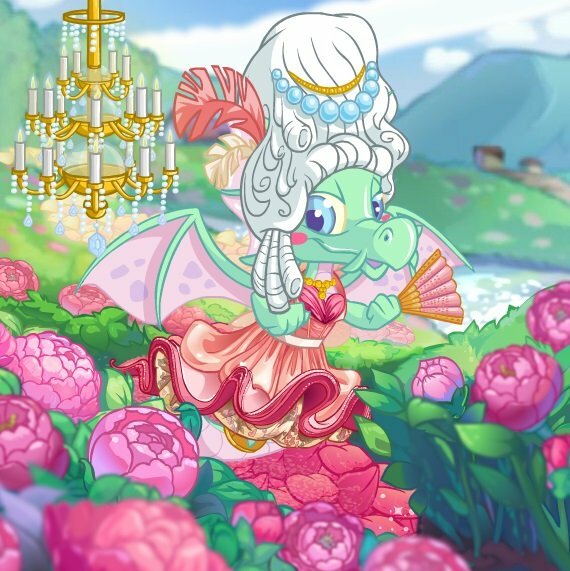 After every three petpets you shoot in the bucket (they don't have to succeed each other right away), you rise a level. There are 8 levels in total. I found a way to angle my cannon that works almost every time. I draw an imaginary line between the edge of the bucket and the edge of the cannon. I think you will have to practice a few times to fully understand what I mean though, but this method really helps me out. Of course you should handle the rule that a heavy petpet needs more power than a light petpet, but in the end it's all a matter of feeling. And the only way to obtain this feeling is to practice, practice, practice. A heavy petpet gives more points than a light petpet when you score. And for every three petpets that reach the bucket, you rise a level. Considering these two facts, a strategy to obtain more points can be developed. One wants to get as much as possible out of a level. Three scores with, for instance, 1.2kg petpets will give you a higher score dan three scores with 0.8kg petpets. 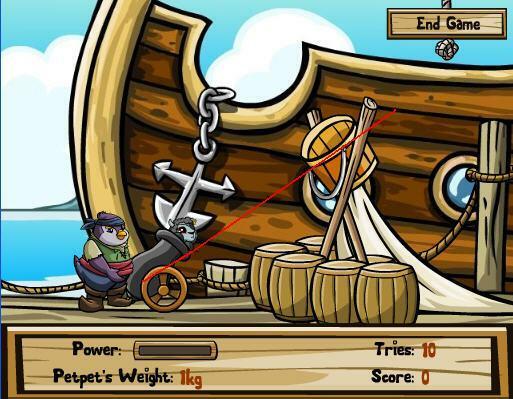 So, when you get low weighed petpets, you could miss on purpose - waiting for a big one. This is a fine strategy, but only for the more advanced players, since missing on purpose won't restrain the number of left tries to lower, so you can't afford to miss the other ones too. When you're tired of Petpet Cannonball or want some more practice, I recommend the flash game Ultimate Bullseye. This game uses the same basics as Petpet Cannonball and can really help to improve your cannon skills. Petpet Cannonball is a fun game and after a bit of practice it isn't that harsh anymore. It is also a matter of getting used to the game and to all its factors, like the weight of the petpets, to get this feeling I talked about earlier. As long as you don't give up at the first try, you'll soon be skilled enough to make a nice amount of neopoints out of it. And if not: for every game counts that some are better at it than others. Good luck and have fun.